As Ohio Faces vote-rigging lawsuit, are dems, liberals, election officials ready to safeguard votes? There's mounting fall-out from reports, first broken by The Free Press, that a Mitt Romney-linked company owns the Hart Intercivic voting machines used in key counties in Colorado, Ohio and other states. The stories have stoked new fears about a "stolen" election. 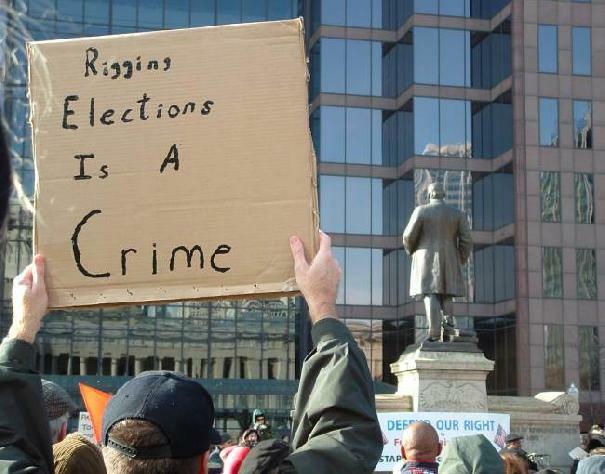 OHIO – VOTE HEIST 2012? A Columbus press conference on election fraud risks with Green Party presidential candidate Dr. Jill Stein, Vice Presidential candidate Cheri Honkala, and FreePress.org editor and Green senatorial candidate Bob Fitrakis at the Ohio State House, Oct. 2, 2012. Citizen concerns about untested software have multiplied since the Columbus Free Press broke the news that Ohio Secretary of State Jon Husted's office installed uncertified and untested software on the central vote tabulation machines in up to 39 counties in the state. WASHINGTON – The Justice Department announced today that its Civil Rights Division plans to deploy more than 780 federal observers and department personnel to 51 jurisdictions in 23 states for the Nov. 6, 2012, general election. Although state and local governments have primary responsibility for administering elections, the Civil Rights Division is charged with enforcing the federal voting rights laws that protect the rights of all citizens to access the ballot on Election Day. In the days leading up to and throughout Election Day, Civil Rights Division staff members will be available by telephone to receive complaints related to possible violations of the federal voting rights laws (toll free 1-800-253-3931 or 202-307-2767 or TTY 1-877-267-8971). In addition, individuals may also report such complaints by fax to 202-307-3961, by email to voting.section@usdoj.gov and by a complaint form on the department’s website: www.justice.gov/crt/about/vot/. Allegations of election fraud are handled by the 94 U.S. Attorneys’ Offices across the country and the Criminal Division’s Public Integrity Section. Complaints may be directed to any of the local U.S. Attorneys’ Offices, the local FBI offices or the Public Integrity Section at 202-514-1412. Since the passage of the Voting Rights Act of 1965, the department has regularly sent observers and monitors around the country to protect the rights of voters. The Voting Rights Act prohibits discrimination in the election process on the basis of race, color or membership in a minority language group. In addition, the act requires certain covered jurisdictions to provide language assistance during the election process. Under the Voting Rights Act, the department is authorized to ask the Office of Personnel Management to send federal observers to areas that have been certified for coverage by a federal court or the attorney general. The department also may send its own staff to monitor elections in other jurisdictions. The observers and department personnel will gather information on, among other things, whether voters are subject to different voting qualifications or procedures on the basis of race, color, or membership in a language minority group; whether jurisdictions are complying with the minority language provisions of the Voting Rights Act; whether jurisdictions permit voters to receive assistance by a person of his or her choice if the voter is blind, has a disability, or is unable to read or write; whether jurisdictions allow voters with disabilities to cast a private and independent ballot; whether jurisdictions comply with the voter registration list requirements of the National Voter Registration Act; and whether jurisdictions comply with the provisional ballot requirements of the Help America Vote Act. To assist in these inquiries, the department has deployed observers and monitors who speak Spanish and a variety of Asian and Native American languages. Both the federal observers and department personnel will coordinate monitoring activities, and department attorneys maintain contact with local election officials. Last month, the Justice Department announced efforts to ensure that all qualified voters have the opportunity to cast their ballots and have their votes counted free of discrimination, intimidation or fraud in the election process. More information about the Voting Rights Act and other federal voting and election-related laws is available on the Civil Rights Division’s website at www.usdoj.gov/crt/voting.